Efforts continued this week in the lower Snake River to manipulate water temperatures and flows to provide the best possible migration conditions for endangered Snake River sockeye salmon. But water and salmon managers are feeling the increasing pinch of a long summer with hot, dry weather and diminishing water storage. 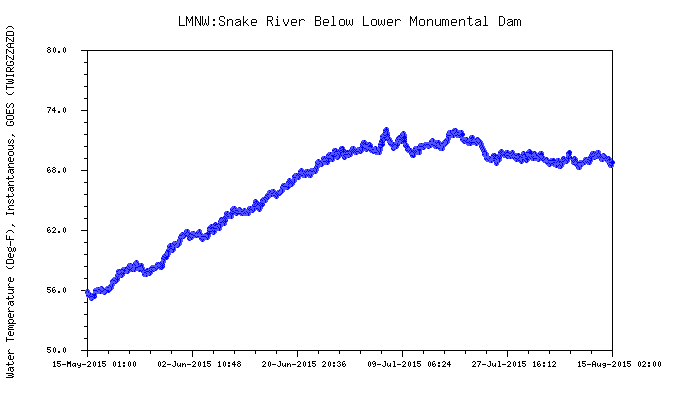 Dam operations affecting sockeye migration to the Snake River Basin dominated discussions among the Technical Management Team, an interagency panel of decision makers that meets regularly in Portland. A major focus at Wednesday's TMT meeting were operations at Dworshak Dam (on the north fork of Idaho's Clearwater River) that have been aimed at maintaining cool flows -- in a target range of 68 degrees or lower-- to maximize sockeye migration conditions in lower Snake River. 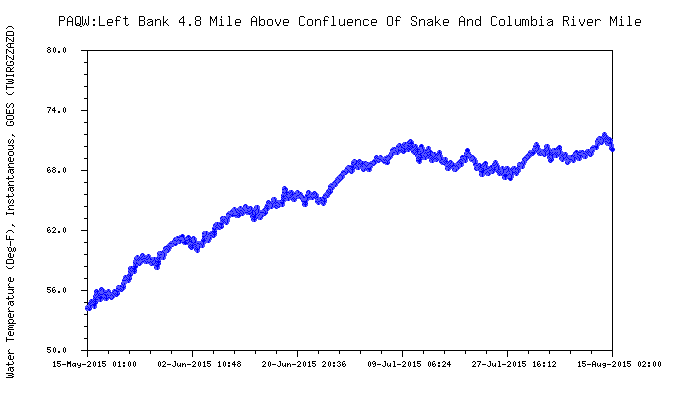 Meanwhile, the Idaho Department of Fish and Game reported July 27 that the first migrating sockeye managed to reach the Sawtooth Basin near Stanley, Idaho. About 42 sockeye salmon haven trapped near the Lower Granite Dam and transported to the Eagle Hatchery near Boise, to eventually be released in the Sawtooth Basin. "That's not a lot but it still seems to be somewhat of a success," said Trevor Conder of NOAA Fisheries during the Thursday TMT meeting. Conder said the people who are running the traps have been doing an excellent job of capturing and transporting fish without mortalities. Biologists are concerned high water temperatures will stall and kill sockeye salmon before they reach their spawning grounds in the Sawtooth Basin. Through July 27, 368 sockeye had been counted at Lower Granite Dam about 30 miles from Lewiston, Idaho, but there are concerns that only a fraction of them will make it to the Sawtooth Basin. The southern-most population of sockeye salmon in the world swims 900 miles from the Pacific Ocean to a 6,500-foot elevation in central Idaho's mountains to spawn. Idaho Fish and Game has taken an adaptive management approach for sockeye, adjusting strategies to meet changing environmental conditions. This summer, cooler water was pumped from the depths of Lower Granite Reservoir to improve opportunities to trap sockeye and transport them upstream. Other hydro projects across the basin have been managed in similar ways to cool water temperatures and optimize flows, but a good example has been the operations at Dworshak Dam, which had the attention of the TMT this week. 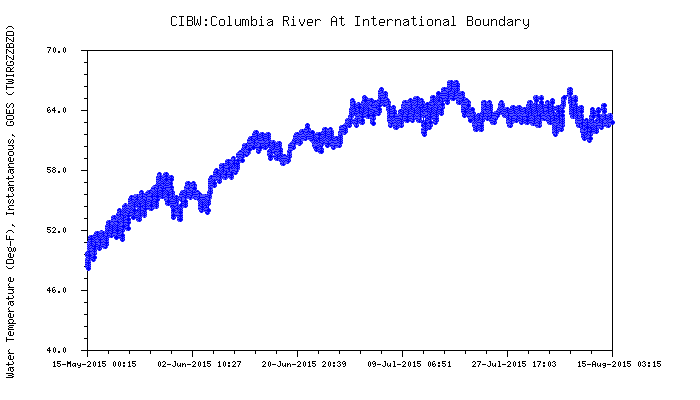 The panel reached a general consensus to maintain flows at 7.5 thousand cubic feet per second through Thursday, then increase flows to full powerhouse capacity in order to keep downstream water temperatures at 68 degrees or less through the weekend. But operating the project involves meeting needs beyond conditions for fish. 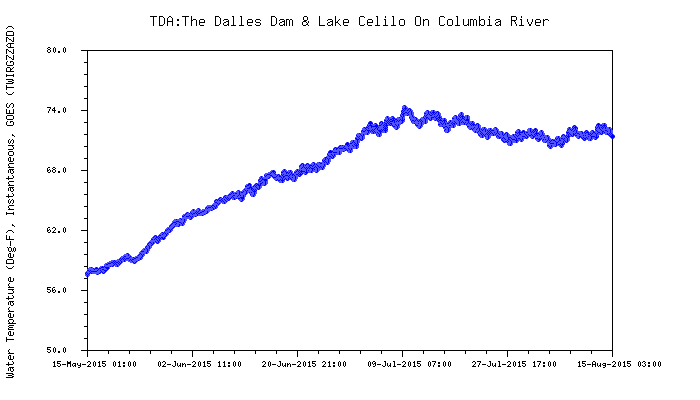 Releases from Dworshak Dam will be ramped down to about 3 kcfs for 6 hours on Aug. 3 in order to allow for repairs to a transmission line breaker downstream, and then they will be ramped back up to 7.5 kcfs for a week. 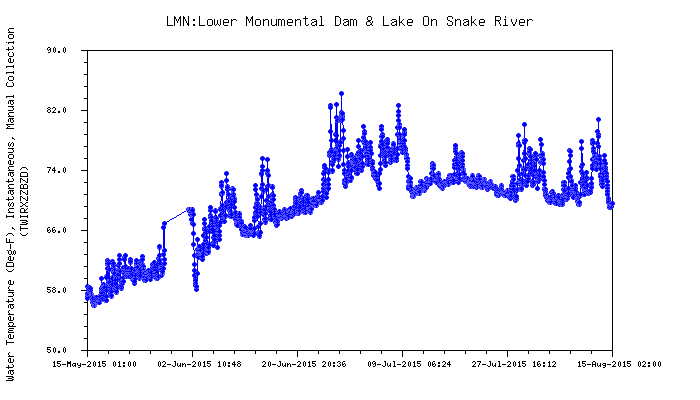 Conditions on the Snake River will then be monitored closely, with a preference toward maintaining temperatures below 68 degrees, but there was acknowledgement among TMT members that flows above 7.5 kcfs probably cannot be maintained through August because needed water storage will be depleted. "My recommendation would be to continue to target the criteria of 68 degrees through one more week," said Russ Kiefer, a fisheries manager with Idaho Fish and Game. "Pretty soon, we will have to end that. We can't likely continue (higher flows) through the summer." Other efforts to help sockeye on the Snake River over the last week have included special operations aimed at cooling waters at Little Goose Dam and just upstream at Lower Granite Dam. 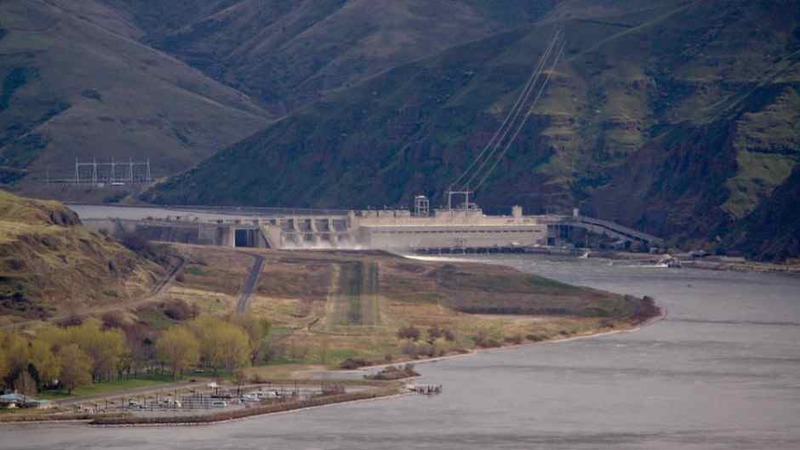 The operations were largely aimed at releasing water through turbines closest to fish ladders, timed at overnight hours, in order to provide the coolest flows possible to entice fish to pass the ladders. The special operations got underway last week and were extended for a two-day period this week. "The operation of two powerhouse units during the time of highest adult sockeye passage would provide all the flow and the coolest water near the fishway entrances, encouraging sockeye to congregate and find the fish ladder entrances," a NOAA Fisheries letter in support of the operations stated. 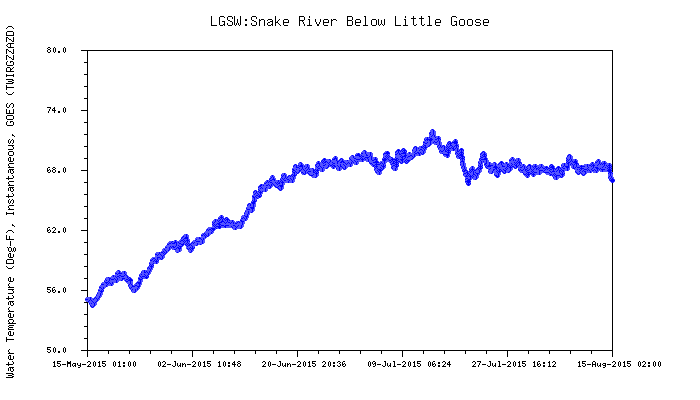 "This would likely increase the probability that adults will successfully pass upstream through the fishway and migrate on to Lower Granite Dam." As of July 29, the Fish Passage Center reports that 508,389 sockeye, most headed to Central Washington, had reached Bonneville Dam, but counts have progressively diminished upstream, to 426,136 at The Dalles, 274,276 at McNary Dam. 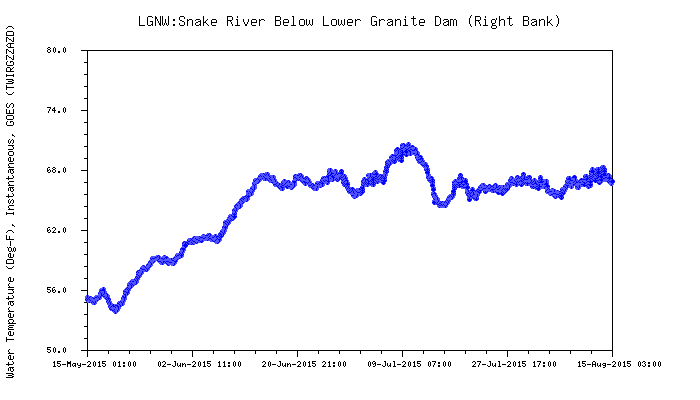 For Snake River sockeye, 961 were counted at Ice Harbor Dam, 835 at Lower Monumental Dam, 542 at Little Goose Dam, and just 377 at Lower Granite Dam -- and of course, the one recorded sockeye to naturally migrate up the Salmon River to central Idaho. An impromptu TMT meeting was held Thursday afternoon to discuss how long trap-and-haul operations for sockeye should continue, given the possibility that trapping efforts might be yielding diminishing returns. The panel roughly agreed that sockeye trapping efforts should continue at least through Aug. 5 in order to assess how successful the operations are. Trapping and transporting sockeye is one of many safeguards IDFG implemented to restore the most southern sockeye population in the world and a unique fish that swims 900 miles from the Pacific Ocean and 6,500-feet elevation to Central Idaho's mountains. Idaho's sockeye population has improved over the last decade. An abundant sockeye return in 2010 allowed IDFG to try a pilot project where 19 sockeye were trapped and trucked from Lower Granite Dam to the Eagle Hatchery to see if the fish could survive the rigors of transport, which they did. 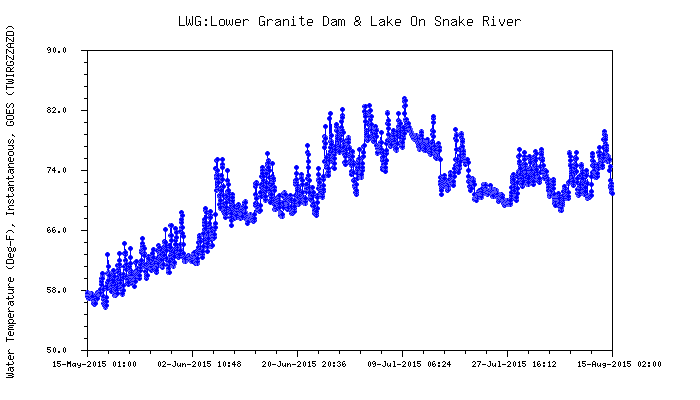 IDFG tried trapping again during a heat wave in 2013, but problems associated with getting cool water into Lower Granite's fish trap lead to no sockeye trapped. This summer, cooler water was pumped from deeper in Lower Granite Reservoir so IDFG personnel could trap and transport them. Biologists are currently in a wait-and-see mode for the fish remaining in the rivers. "I don't know what to expect because this is a year we've never seen before," said IDFG's Senior Sockeye Research Biologist Mike Peterson. "We're going to learn the thermal tolerances of these fish." After sockeye cross Lower Granite Dam, they still have 400 miles to travel in the Snake and Salmon rivers to reach the Sawtooth Basin, and biologist have limited ability to monitor their progress, or know what happened to those that didn't make it. Biologists know warm water slows their progress, and "every day they're in warm water takes its toll," Peterson said. If there's a silver lining, it will be gaining more knowledge about sockeye. "Poor conditions mean we're learning about these fish, and in the past, we didn't have enough fish to learn from," he said. "Experience drives what we do in the future." In the last decade, between 30 and 78 percent of sockeye that crossed Lower Granite Dam completed the trip to the Sawtooth Basin. "I'm hoping we get that 30 percent conversion, but realistically it could be less," Peterson said. Even at a 30-percent return rate, it would be the smallest return since 2007. After sockeye cross Lower Granite Dam, it typically takes 30 to 35 days for the fish to reach the Sawtooth Basin, and it's "almost like clockwork," Peterson said. Sockeye started trickling across the dam in late May and June, but most crossed in July and are due to arrive at the Sawtooth Basin in August. Even with that one-year spike, in the 17-year span between when sockeye were listed in 1991 and 2007, only 343 fish were trapped in the Sawtooth Basin, and in 13 of those years, fewer than 10 returned. 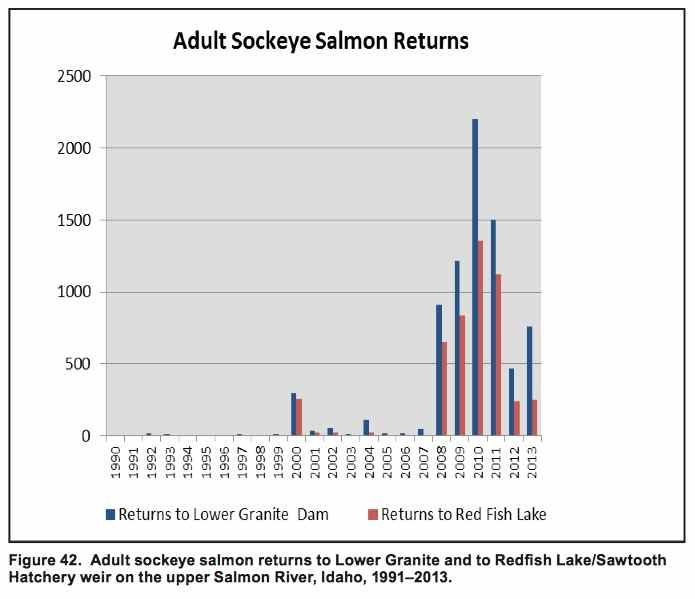 Fast forward to 2008, with the captive breeding program and favorable river and ocean conditions, the annual sockeye returns since 2008 have averaged 837 fish, including 1,516 in 2014, which was the largest return to the Sawtooth Basin since 1955. When enough adults return from the ocean, IDFG biologists allow some to naturally spawn in Redfish Lake, which has happened every year since 2008, and four other years prior. 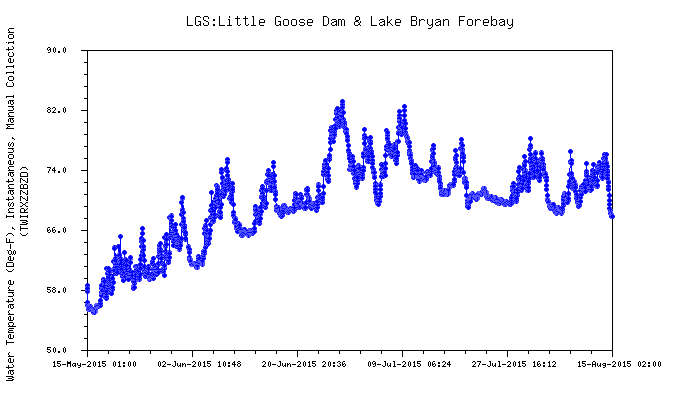 Releasing spawners into the lake is expected to occur again this year. 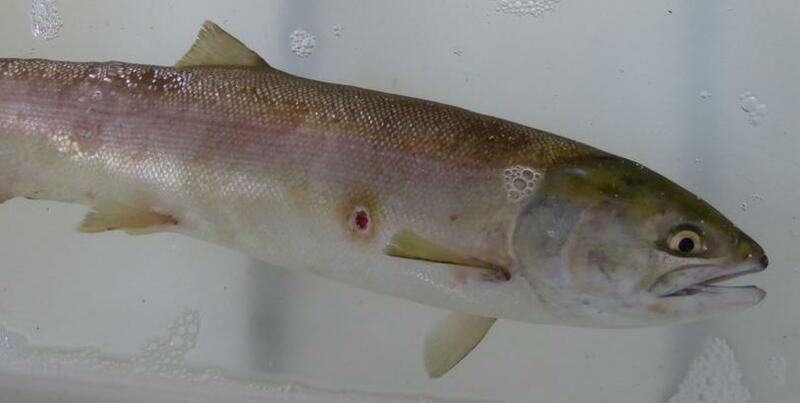 Biologists learned that juvenile sockeye "smolts" naturally produced in the wild return as adults at higher rates than those raised in hatcheries, so IDFG wants to continue natural production. But it's too risky to rely solely on nature to recover sockeye. Regardless of how many sockeye return this summer, IDFG expects to ramp up its release of juvenile sockeye in 2016 and 2017. Unlike other salmon and steelhead hatcheries, which rely solely on the current year's adult returns to provide eggs for the following year's smolt release to migrate to the ocean, IDFG's captive breeding program ensures sockeye are available to produce offspring if others don't return from the ocean. "That's one of the saving graces of this program, we have those captive fish," Peterson said. The captive breeding program keeps two genetically identical populations in Eagle and Port Orchard, Wash. Keeping those populations separate means if one population is lost to a catastrophe, the genetics would remain at another location. Eggs taken from captive and adult returns rebuild the captive brood stock each year, but the vast majority of the eggs are sent to other hatcheries, including IDFG's new Springfield Hatchery in Eastern Idaho. The Springfield Hatchery was built in 2013 with money from the Bonneville Power Administration. It is used exclusively for sockeye production, and it will increase the department's capacity to grow young sockeye for future releases. Between 2011-14, IDFG annually released about 300,000 hatchery-raised juvenile sockeye smolts. That number increased to more than 400,000 smolts last spring, thanks in part to the Springfield hatchery producing more smolts. IDFG biologists expect to ramp up those numbers to 700,000 in 2016 and reach Springfield hatchery's capacity of 1 million smolts in 2017.